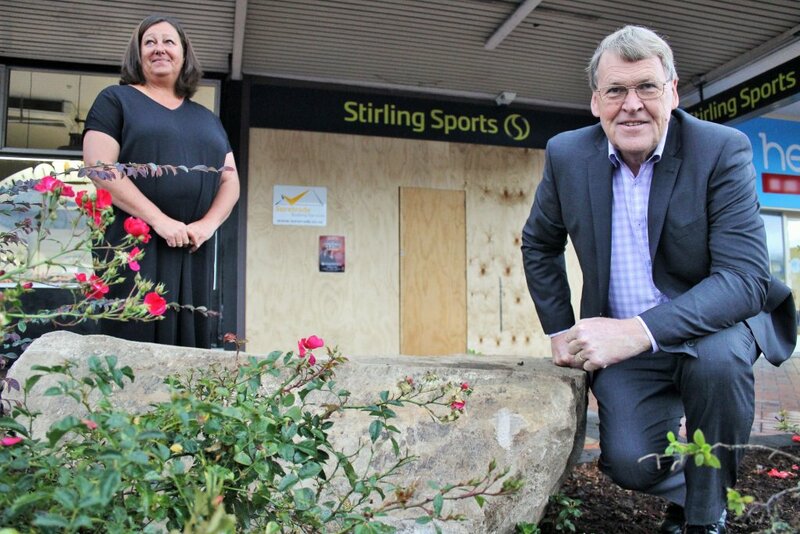 Waipā District Mayor Jim Mylchreest (right) came up with the solution to install boulders outside Stirling Sports and has been applauded by Cambridge Business Chamber CEO Kelly Bouzaid (left). A “sterling” solution to halt a string of ram raids at Stirling Sports in Cambridge was set in stone quite literally this week. Two large rocks in the garden outside the store now provide a block to the path used five times by thieves to smash their way into the building using vehicles. “It makes it harder for them doesn’t it?” Waipā mayor Jim Mylchreest said on Wednesday after the boulders were put in place. Mylchreest said he was hugely sympathetic towards the store owner and tenant Sarah Nicholl, whose plight was illustrated in last week’s Cambridge News. A fifth ram raid prompted calls for bollards outside the shop, but there was no budget for it. The Mayor said Council couldn’t spend rate payer money on the private security of a single store by installing bollards – which would cost around $12,000 – but they wanted to do something. So the mayor came up with a cheaper, quicker alternative. “I was just thinking about something that could go in really quickly that wouldn’t require checking underground services and that sort of thing,” he said. “Let’s at least put big boulders in the way and work with the community, police and the Chamber of Commerce to find a better, long-term solution. They’re an amenity and they aren’t costing rate payers a lot of money. Cambridge Business Chamber CEO Kelly Bouzaid applauded Mayor Jim and the council for being so swift in their response. “Hopefully it gives Sarah (Nicholl, store owner) good reason to feel both supported and encouraged to stay, and that the insurance company feels there’s enough support there to continue business as usual,” she said. Nicholl said she was grateful for Council’s response and everyone’s concern and support following the fifth ramraid of the store on March 24. She said it was still too early to confirm the store’s long-term future. Nicholl had previously put other security measures in place at the store, including a steel bar, but that was ripped from its concrete foundations during the last ramraid. 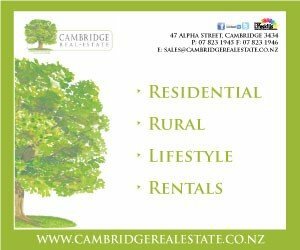 The district council is planning to install CCTV cameras in Cambridge and Te Awamutu in the next few weeks. Stirling Sports isn’t the only store to be burgled in Cambridge recently. Steen and Morrow Betta Electrical Cambridge was also burgled early last month. Thieves broke through a roller door and two other doors to get into the shop and take electrical items. One arrest has been made so far following the latest Stirling Sports ram-raid and police are looking for two other people.